The Sergeant Major reminded me yesterday that one hundred years ago the 2nd Battalion was nearly destroyed in the Battle on the Somme in France and Belgium with total casualties of 18 (9 killed and 9 wounded) Officers and 601 (186 killed and 415 wounded) Other Ranks Leo Clarke, VC of the 2nd Battalion died of wounds in hospital on 19 October 1916. He had recently been nominated for the VC and at the time of his death he was reportedly leading the Bomber Section of the battalion, with his brother as his 2IC. 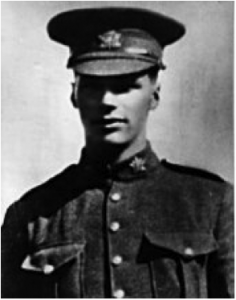 My uncle, Leo Clarke – he was one of the VCs on Valour Road, of which there are three, and it has never been known anywhere in the world where there were three VCs on one street or within one block. When they were over at the Battle of the Somme, they had to go ahead and clear the enemy out of the trench so the whole battalion could advance. Dad took a group of men and he went to the right, and Leo took a group and went to the left. Dad didn’t run into too much opposition, but Leo ran into quite a bit. All his group were killed except for one other man – his Sergeant. His enemy advanced and came through. Leo had used up his grenades. He had bought himself a .45 automatic for a pistol which he carried, and as the enemy advanced and came after them… dad wrote it down here; he said there was a lot of hand-to-hand fighting, which Leo was quite adept at. Although they were badly outnumbered and their grenades were all spent, Leo was about the only one that wasn’t hurt at that point, other than a wound on the knee, which wasn’t that serious that he couldn’t keep on going. There were five Germans apparently that came after Leo. He shot them and he beat one up, and kept one for a prisoner. Later on, he heard that he’d been recommended for [the VC] for killing twenty-two Germans and two officers. He said, “the Colonel came up and congratulated me,” and then he’d heard that he’d been recommended the VC. Later on, there were some officers who came over and they were standing at the top of the trench, overlooking and trying to see what the Germans were doing and where they were positioned. They were warned that the reflection on the binoculars they had could tip off the Germans as to where they were located. It was ignored at the time, and the shelling started. Dad went into one little cubby hole and Leo was further down the trench – he went into another – and one shell landed beside Leo. Dad got out, he was alright, and he ran down to find Leo. Finally, when he took the earth off the top, Leo smiled up at him and said, “I knew you’d find me, Charlie!” It was the next day, when dad was marching, a motorcyclist and called out to him, and he said, “Charlie, I’m afraid your brother died.” Dad said it was the longest and toughest day of his life.